This study describes the adsorption and photocatalytic removal of methylene blue (MB) from aqueous solution by surface-modified TiO2 nanoparticles under ultraviolet irradiation in a batch system. The 5-sulfosalicylic acid grafted TiO2 (5-SA-TiO2) as a photocatalyst was characterized by means of XRD, FTIR and SEM techniques. The surface of TiO2 nanoparticles was modified by 5-sulfosalicylic acid (5-SA) to increase performance by altering surface properties. Notably, in contrast with the adsorption process, the remarkable removal enhancement of MB dye was observed by photocatalytic degradation process from aqueous solution. The adsorption and photocatalytic degradation kinetics of MB using 5-SA-TiO2 nanoparticles have also been investigated. The results show that the photocatalytic degradation was good fit with the pseudo-first-order kinetic model (R2 > 0.99). The adsorption isotherm of MB onto modified TiO2 nanoparticles fitted into the Temkin equation. In addition, thermodynamic studies indicate the spontaneous behavior of adsorption and photocatalytic degradation processes. Organic and inorganic colorants are widely used in various industries, including the paper and food industries, textile dying, cosmetics, pigments and paints, and high technology materials, etc . On the other hand, organic dyes that are used by different industries are now mostly synthetic. Organic dyes are regularly derived from the petroleum-based intermediates. Meanwhile, more than 10,000 types of synthetic organic colorants are used widely in the industrial processes. About 10-15% of these dyes may be found in industrial efﬂuents . Textile industries produce large amounts of liquid wastes that contain organic colorants. These wastes are rich in dyes, some of which are carcinogenic and pose a major threat to health and the environment if not properly treated . Methylene blue is one of them which have been shown to have harmful effects on living organisms on short periods of exposure . In recent years, several treatment processes such as flocculation, chemical coagulation, simple sedimentation, aerated lagoons, aerobic activated sludge, trickling filters, reverse osmosis, photocatalytic oxidation, adsorption and electrodialysis have been developed to treat these wastes [5-11]. The adsorption process is desired as an environmentally friendly and cost effective procedure. It has high purification yield and the choice of adsorbent plays very essential role in determining its cost efficiency . On the other hand, photocatalytic oxidation procedure was usually selected for its high yield, low energy use, simple process, mild reaction conditions, wide application range, and little secondary pollution . In addition, photoactivity may be entitled as a photoinduced reaction that is enhanced using the presence of an adsorbent. Among the adsorbents having photocatalytic properties, nano-TiO2 and surface-modified nano-TiO2 particles have commercial benefits for their low cost, large specific surface area, nontoxicity, long service life, high efficiency and simple assemble technology [14-18]. 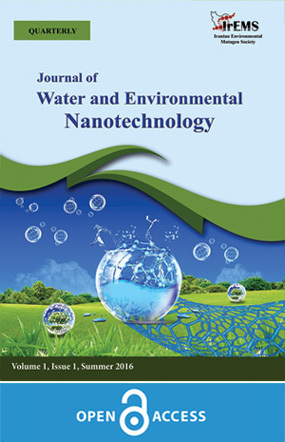 Although TiO2 photoactivity was found to be effective for the destruction of a wide variety of environmental contaminants present in water and wastewater, this knowledge has not yet been effectively commercialized since of the issues related to the separation of TiO2 particles from the solution after treatment. In order to solve this problem, supported photoadsorbents have been developed [19-21]. Unfortunately, the surface area of adsorbent subjected to solution in supported systems is lower than in suspended systems . In the present study, 5-sulfosalicylic acid grafted TiO2 (5-SA-TiO2) as a photoadsorbent for the removal of MB were synthesized and characterized by means of X-ray diffraction (XRD), Fourier transform infrared spectra (FTIR) and scanning electron microscope (SEM). The effects of various parameters, such as contact time, adsorbent dose, pH, dye concentration, photocatalytic activity and temperature were examined. Furthermore, the adsorption kinetics, isotherms and thermodynamics of MB dye onto synthetic adsorbent were studied. Methylene blue was supplied by Sigma–Aldrich Company, and used without further purification. The chemical structure of MB is shown in Scheme 1. Titanium isopropoxide (TIP) was obtained from Merck Chemical Company. 5-sulfosalicylic acid was obtained from Sigma Chemical Company and its solutions were used freshly in order to avoid oxidation by dissolved oxygen. All other chemicals were of the highest purity commercially available. De-ionized water was purified with a Milli-Q water ion-exchange system and was used in all experiments. TiO2 nanoparticles were synthesized using the titanium isopropoxide (TIP) according to a method described in the literature . In situ surface modification was carried out through stirring TiO2 nanoparticles for 60 min in the saturated solution of 5-sulfosalicylic acid. It was worth noting that the color of the TiO2 surface changed into yellow, indicating that a chemical reaction took place (i.e., chemisorption) between 5-sulfosalicylic acid (surface modifier) and TiO2. After filtration, the modified TiO2 was washed with deionized water for three times and then heat-treated for 30 min at 105°C. The resulting powders were characterized by XRD, FTIR and SEM. where qe is the adsorption capacity of adsorbent, C0 and Ce (mg L−1) are concentration of MB at the initial and equilibrium states, respectively, V (L) is the volume of the solution and m is the weight of adsorbent (g). TiO2 nanoparticles could be surface modified by organic and inorganic compounds [24-27]. Herein, TiO2 nanoparticles are modified by chemisorption of 5-sulfosalicylic acid (5-SA) surface modification agent. The role of 5-SA on the improvement TiO2 nanoparticles might be due to the enhancement of the affinity between dye and the 5-SA-TiO2, larger surface areas by the reduction in particle size, and the increased formation of mobile OH radicals . The XRD patterns of TiO2 and 5-SA-TiO2 nanoparticles are shown in Fig. 1. As shown in Fig. 1a, diffraction peaks for TiO2 (2θ = 25°, 38°, 48°, 54°, 55° and 63°) are observed for both pure TiO2 ananoparticles and surface-modified TiO2. These diffraction peaks for TiO2 can be attribued to anatase phase. As shown in Fig. 1b, the intensity of diffraction peaks in the surface-modified TiO2 is decreased, which indicates that the surface modification of TiO2 nanoparticles [29-30]. This confirms the existence of 5-sulfosaliccylic acid surface modifier in TiO2 nanoparticles. The functional groups present in the modified TiO2 nanoparticles can be studied using FTIR spectroscopy. Fig. 2 shows the FTIR spectra of TiO2, 5-SA and 5-SA-TiO2 samples. From spectra of TiO2, The stretching vibration of absorbed water as well as surface hydroxyl groups (OH) which presented in the TiO2 nanoparticles were confirmed by the broad absorption band between 3200 and 3450 cm-1 and the low intensity peak at 1640 cm-1. After surface modification by 5-SA, The absorption peaks from hydroxyl groups (OH) groups (3350-3350 cm-1), phenyl (1442 and 1477 cm-1), SO3H (1164 and 1224 cm-1), C=O (1672 cm-1), and C-O (1470 cm-1) were observed on 5-SA-TiO2 surface. These functional groups indicate that the 5-sulfosaliccylic acid as modifier was chemically immobilized on the surface of nanoparticles. Thus, it can be concluded that the TiO2 nanoparticle modified with 5-SA. In addition, in order to investigate the morphology of the obtained adsorbent, the SEM image of TiO2 and 5-SA-TiO2 nanoparticles are illustrated in Fig. 3. It was found that the surface modifier could not only affect the dispersibility of the TiO2 particles, but also change their morphology and size of the particles. Furthermore, SEM study of 5-SA-TiO2 nanoparticle, indicate that the particle size of the prepared sample is less than 60 nm. The effect of pH at a range of 3.0-11.0 on the adsorption and photocatalytic degradation of MB was shown in Fig. 4. As shown in Fig. 4, the removal capacity increased with increasing pH value from 3.0 to 6.0 and then decreased with the more increase of the pH from 6.0 to 11.0. Therefore, the optimum pH value for the adsorption and photocatalytic degradation of MB was 6.0. The isoelectric point of TiO2was 5.1. Consequently, at pH higher than 5.1, the TiO2 surface would remain negatively charged. Hovewer, the MB removel capacity was decreased at pH higher than 6. The effect of adsorbent dosage on MB removal using adsorption and photocatalytic degradation from aqueous solution is shown in Fig. 5. As shown in Fig. 5, the MB removal efﬁciency increased with the addition of 5-SA-TiO2 nanoparticle from 0.02 to 0.08 g in the adsorption process, because the adsorption surface and accessibility of more adsorption sites increased. However, if the adsorption capacity was expressed in mg adsorbed MB per gram of 5-SA-TiO2 nanoparticle as adsorbent, the capacity decreased with the increasing amount of adsorbent. This may be attributed to association of adsorption sites resulting in a decrease in total surface area presented to the dye molecules and an increase in dispersion path length [ 31]. Meanwhile, from the Fig. 5, it was observed that the photocatalytic degradation of MB increased from 52% to 93.3% with increasing the dosage of 5-SA-TiO2 photoadsorbent from 0.02 to 0.08 g. It is due to the active sites for the production of OH free radicals was increased. However, further increase of the 5-SA-TiO2 photoadsorbent did not provide more increment in the percentage of the dye removed. This can be attributed to the fact that after a certain dosage of 5-SA-TiO2, the maximum removal is achieved and the amount of dyes adsorbed and the amount of free dyes remains constant even with further addition of the 5-SA-TiO2 nanoparticle as photoadsorbent. Therefore, 0.02 g as an optimal dosage of 5-SA-TiO2 photoadsorbent for the degradation of MB was used in all the studies. The influence of initial dye concentration on the adsorption and photodegradiation efficiency of MB is shown in Fig. 6. In the adsorption process by 5-SA-TiO2 nanoparticles, the removal efficiency of MB dye molecules decreased with an increase in the dye concentration. In other words, the amount of the MB adsorbed onto 5-SA-TiO2 nanoparticle increased with an increase in the initial dye concentration of solution if the amount of adsorbent was kept unchanged. This is due to the increase in the driving force of the concentration gradient with the higher initial dye concentration. Therefore, the remaining amounts of dye molecules will be higher for high initial concentrations of dye. Furthermore, the effect of initial dye concentration on the degree of photodecolorization using 5-SA-TiO2 nanoparticle as catalyst was studied by varying initial dye concentration from 5 to 15 mg/L. It is observed that the photodecolorization of MB decreases with increasing of the initial dye concentration. The presumed reason is that, when the initial dye concentration is increased, more and more dye molecules are adsorbed on the surface of 5-SA-TiO2 nanoparticle. Therefore, the generation of OH free radicals will be reduced since the active sites for adsorption were covered by dye molecules. In addition, as the initial concentration of the MB increases, the photons get intercepted before they can reach the adsorbent surface. Consequently, it has been found that the removal efficiency of MB is high for photodecolorization compared to that of adsorption process. The effect of the temperature on MB removal from aqueose solution by 5-SA-TiO2 nanoparticles was investigated at 298, 308 and 318 K. It is observed that contact times required to removalefficiency of MB were approximately 50-60 min for the different temperatures. In addition, the adsorption of MB decreased with increasing temperature as shown in Fig. 7. It can be explained by the fact that higher temperatures most certainly lead to an increase in the solubility of the dye. Moreover, when temperature increased, the intermolecular forces between the organic dye and the active sites of the adsorbent weakened. Therefore the MB dye was more difficult to remove. Several kinetic models were developed to understand for both photocatalytic decolorization and adsorption kinetics. Kinetics study of photocatalytic decolorization of MB dye in the presence of 5-SA-TiO2 nanoparticles was studied at 5, 10, 15 and 20 mg/L, and the decolorization rate was monitored by studying the contact time up to 150 min. The mechanism of MB removal using the 5-SA-TiO2 nanoparticle as photocatalyst was studied by the pseudo ﬁrst-order and pseudo-second-order kinetic models. The liner plot of ln(qe­qt) vs. t for the pseudo-first-order kinetic model and t/qt vs. t for the pseudo-second-order kinetic model is shown in Fig. 8. The constants of the two models with the correlation coefficients are shown in Table 1. As shown in Table 1, the value of the correlation coefficient R2 for the pseudo-first-order model was greater than 0.99 for the photocatalytic degradeation process. The correlation coefficients of the two initial MB concentrations are equal to 0.99, which are very close to 1.0. These results show that the photocatalytic degradeation of MB dye in aqueous solutions using the 5-SA-TiO2 nanoparticles can be described by pseudo-first-order kinetic model. A similar study was performed for adsorption of MB onto the 5-SA-TiO2 as adsorbent ( Fig. 9 and Table 1). However, the adsorption process of MB tends to follow pseudo-second-order kinetics in the presence of 5-SA-TiO2 as adsorbent. It is also observed that the 5-SA-TiO2 nanoparticle as photocatalyst exhibits better MB removal efficiency than that of the 5-SA-TiO2 nanoparticle as adsorbent. The temperature is usually an important factor which affects many adsorption processes, and it is an indicator of the adsorption nature. The termodynamic parameters, such as ∆H°, ∆S° and ∆G° for 5-SA-TiO2 nanoparticle can be related to the distribution coefficient of the solute between the solid and liquid phases. The effect of the temperature on the MB removal efficiency was evaluated at 298 K. The calculated thermodynamic parameters are given in Table 2. Acoording to the Table 2, the adsorption and photodegradation processes of MB using the 5-SA-TiO2 nanoparticle are spontaneous. Where B = RT/b, b is the Temkin constant related to heat of adsorption (J/mol), A is the Temkin isotherm constant (L/g), R is the gas constant (8.314 J/mol K), and T is the absolute temperature (K). The Langmuir, Freundlich and Temkin isotherm parameters and the correlation coefficient (R2) are summarized in Table 3. As illustrated in Table 3, the correlation coefficient (R2), for the Temkin isotherm model was 0.99. In other words, the R2 of the Temkin isotherm was greater than that of the two other isotherms for the adsorption of MB. This indicates that the adsorption of MB onto the 5-SA-TiO2 adsorbent is better described by the Temkin isotherm model than the Langmuir and Freundlich isotherms. In summary, the surface of TiO2 nanoparticles was successfully modified by 5-sulfosalicylic acid (5-SA) through chemisorption process and used for removal of MB from aqueous solution. The structure analysis by XRD, FTIR and SEM confirmed the surface modification of TiO2 nanoparticles by 5-sulfosalicylic acid. Comparison of photocatalytic activity and adsorption properties of 5-SA-TiO2 nanoparticle has clearly showed that the photocatalytic degradation process was more effective for decolorization of MB from the aqueous media. The results indicated that the photocatalytic degradeation and adsorption of MB dye using the 5-SA-TiO2 nanoparticles can be described by pseudo-first-order and pseudo-second-order kinetic models, respectively. Thermodynamic studies showed that the these both processes were spontaneous. In addition, the Temkin isotherm was found to be the best fitting isotherm model for the adsorption process. 1. Freeman HS, Peters AT. Colorants for non-textile applications: Elsevier; 2000. 636 p.
2. Spadaro JT, Gold MH, Renganathan V. Degradation of azo dyes by the lignin-degrading fungus Phanerochaete chrysosporium. Appl Environ Microbiol. 1992;58(8):2397-401. 3. Elliott A, Hanby WE, Malcolm BR. The near infra-red absorption spectra of natural and synthetic fibres. British Journal of Applied Physics. 1954;5(11):377. 4. El-Sayed GO. Removal of methylene blue and crystal violet from aqueous solutions by palm kernel fiber. Desalination. 2011;272(1–3):225-32. 5. Khaled A, Nemr AE, El-Sikaily A, Abdelwahab O. Removal of Direct N Blue-106 from artificial textile dye effluent using activated carbon from orange peel: Adsorption isotherm and kinetic studies. Journal of Hazardous Materials. 2009;165(1–3):100-10. 6. Sun D, Zhang X, Wu Y, Liu X. Adsorption of anionic dyes from aqueous solution on fly ash. Journal of Hazardous Materials. 2010;181(1–3):335-42. 7. Basiri Parsa J, Hagh Negahdar S. Treatment of wastewater containing Acid Blue 92 dye by advanced ozone-based oxidation methods. Separation and Purification Technology. 2012;98:315-20. 8. Khouni I, Marrot B, Moulin P, Ben Amar R. Decolourization of the reconstituted textile effluent by different process treatments: Enzymatic catalysis, coagulation/flocculation and nanofiltration processes. Desalination. 2011;268(1–3):27-37. 9. Huang J-H, Zhou C-F, Zeng G-M, Li X, Niu J, Huang H-J, et al. Micellar-enhanced ultrafiltration of methylene blue from dye wastewater via a polysulfone hollow fiber membrane. Journal of Membrane Science. 2010;365(1–2):138-44. 10. Madaeni SS, Jamali Z, Islami N. Highly efficient and selective transport of methylene blue through a bulk liquid membrane containing Cyanex 301 as carrier. Separation and Purification Technology. 2011;81(2):116-23. 11. Ma J, Jia Y, Jing Y, Yao Y, Sun J. Kinetics and thermodynamics of methylene blue adsorption by cobalt-hectorite composite. Dyes and Pigments. 2012;93(1–3):1441-6. 12. Elemen S, Akçakoca Kumbasar EP, Yapar S. Modeling the adsorption of textile dye on organoclay using an artificial neural network. Dyes and Pigments. 2012;95(1):102-11. 13. Zangeneh H, Zinatizadeh AAL, Habibi M, Akia M, Hasnain Isa M. Photocatalytic oxidation of organic dyes and pollutants in wastewater using different modified titanium dioxides: A comparative review. Journal of Industrial and Engineering Chemistry. 2015;26:1-36. 14. Tryba B, Morawski AW, Inagaki M. Application of TiO2-mounted activated carbon to the removal of phenol from water. Applied Catalysis B: Environmental. 2003;41(4):427-33. 15. Shun-Xing L, Feng-Ying Z, Wen-Lian C, Ai-Qin H, Yu-Kun X. Surface modification of nanometer size TiO2 with salicylic acid for photocatalytic degradation of 4-nitrophenol. Journal of Hazardous Materials. 2006;135(1–3):431-6. 16. Li G, Liu X, An J, Yang H, Zhang S, Wong P-K, et al. Photocatalytic and photoelectrocatalytic degradation and mineralization of small biological compounds amino acids at TiO2 photoanodes. Catalysis Today. 2015;245:46-53. 17. Carp O, Huisman CL, Reller A. Photoinduced reactivity of titanium dioxide. Progress in Solid State Chemistry. 2004;32(1–2):33-177. 18. Lv K, Hu J, Li X, Li M. Cysteine modified anatase TiO2 hollow microspheres with enhanced visible-light-driven photocatalytic activity. Journal of Molecular Catalysis A: Chemical. 2012;356:78-84. 19. Chester G, Anderson M, Read H, Esplugas S. A jacketed annular membrane photocatalytic reactor for wastewater treatment: degradation of formic acid and atrazine. Journal of Photochemistry and Photobiology A: Chemistry. 1993;71(3):291-7. 20. Franke R, Franke C. Model reactor for photocatalytic degradation of persistent chemicals in ponds and waste water. Chemosphere. 1999;39(15):2651-9. 21. Ling CM, Mohamed AR, Bhatia S. Performance of photocatalytic reactors using immobilized TiO2 film for the degradation of phenol and methylene blue dye present in water stream. Chemosphere. 2004;57(7):547-54. 22. Aguado MA, Anderson MA, Hill CG. Influence of light intensity and membrane properties on the photocatalytic degradation of formic acid over TiO2 ceramic membranes. Journal of Molecular Catalysis. 1994;89(1):165-78. 23. Moafi HF, Shojaie AF, Zanjanchi MA. Titania and titania nanocomposites on cellulosic fibers: Synthesis, characterization and comparative study of photocatalytic activity. Chemical Engineering Journal. 2011;166(1):413-9. 24. Molinari A, Amadelli R, Antolini L, Maldotti A, Battioni P, Mansuy D. Phororedox and photocatalytic processes on Fe(III)–porphyrin surface modified nanocrystalline TiO2. Journal of Molecular Catalysis A: Chemical. 2000;158(2):521-31. 25. Xagas AP, Bernard MC, Hugot-Le Goff A, Spyrellis N, Loizos Z, Falaras P. Surface modification and photosensitisation of TiO2 nanocrystalline films with ascorbic acid. Journal of Photochemistry and Photobiology A: Chemistry. 2000;132(1–2):115-20. 26. Ahn W-Y, Sheeley SA, Rajh T, Cropek DM. Photocatalytic reduction of 4-nitrophenol with arginine-modified titanium dioxide nanoparticles. Applied Catalysis B: Environmental. 2007;74(1–2):103-10. 27. Jiang D, Xu Y, Wu D, Sun Y. Isocyanate-modified TiO2 visible-light-activated photocatalyst. Applied Catalysis B: Environmental. 2009;88(1–2):165-72. 28. Li S, Zheng F, Cai S, Liang W, Li Y. A visible light assisted photocatalytic system for determination of chemical oxygen demand using 5-sulfosalicylic acid in situ surface modified titanium dioxide. Sensors and Actuators B: Chemical. 2013;188:280-5. 29. Sano T, Negishi N, Koike K, Takeuchi K, Matsuzawa S. Preparation of a visible light-responsive photocatalyst from a complex of Ti4+ with a nitrogen-containing ligand. Journal of Materials Chemistry. 2004;14(3):380-4. 30. Prabakaran K, Mohanty S, Nayak SK. Influence of surface modified TiO2 nanoparticles on dielectric properties of PVdF–HFP nanocomposites. Journal of Materials Science: Materials in Electronics. 2014;25(10):4590-602. 31. Kim J, Choi W. TiO2 modified with both phosphate and platinum and its photocatalytic activities. Applied Catalysis B: Environmental. 2011;106(1–2):39-45. 32. Crini G, Badot P-M. Sorption processes and pollution: conventional and non-conventional sorbents for pollutant removal from wastewaters: Presses Univ. Franche-Comté; 2010.